Scary thought this week. The landlord has visited our house today with four viewers. It seems only yesterday that we were moving in! Houses go so quickly in Ormskirk its ideal to start looking December time before they all go. Prices vary from around £65 – £90 pw, with some including bills. Most of them are really close to the University as well , which is ideal. Edge Hill provide a list of houses and approved landlords. If you pop into the SIC building the accommodation team are more than happy to help you with moving. Today’s lecture was positively different from the rest. The first hour was spent watching in horror at contemporary body artists. The likes of Franko B who makes his naked body bleed infront of an audience and Falir Musafar who explores ancient ritual, the body as site and piercing the body. 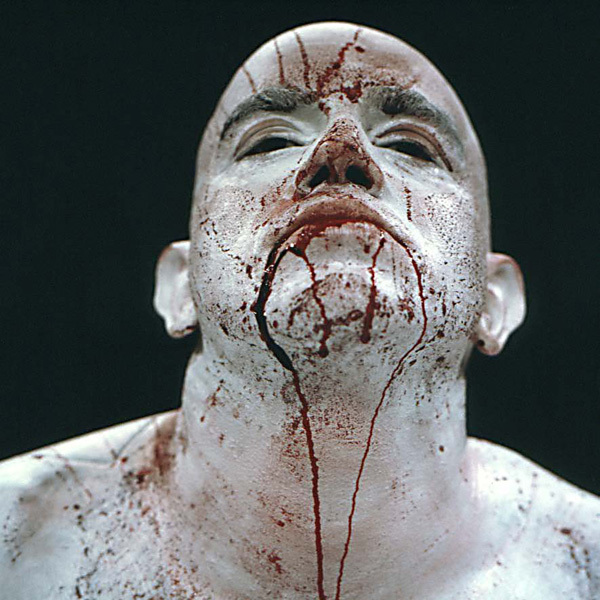 I had to look away when female artist Orlan untook plastic surgery,fully concious on film. Surgically inserting plates in her cheeks in pursuit of the ideal face. Friend of Leigh Bowry’s and subject of Lucien Freud’s famous painting Sue Tilley visited the university today. The chat was refreshing, we talked about 80’s culture in London. How she used to go and party with John Galliano. No one had Facebook , internet or phones people would go out and meet in the same places because that’s where everyone went. Celebrity wasn’t what it is today. She chatted about the outrageous clothes she wore, the drug culture, her friendship with Leigh and punk ballet. An inspiring talk with someone who was so down to earth , completely detached from the snobbery of high art. Starting writing my dissertation research paper exploring contemporary art she is definitely a character I want to explore further. Third year visual ensemble produced a spectacular show on Friday and Saturday. The performance took place in Old Christ Church Liverpool. A haunting building nestled in a large estate it appeared an unsettling place for a performance. Walking through the secret doorway at the side of the church we were greeted by three rabbits. One pacing, one playing with an apple and the other engrossed in a beano comic. We where then guided into the performance area. The empty shell of the church adored with hundreds of frames, string and glaring lights. Among the setting performers sat reading the newspapers, some creating origami flowers and others simply frozen in time. As the performance began performers progressively crawled from behind corners , wrestled in frames and marched in stilts. The concept for the piece revolved around the human rights act. The act was chanted in Indonesian, printed on paper aeroplanes and demonstrated through the torturous movements of the performers. Here’s some of the photos from the show. The Linbury prize is an award for emerging stage designers. Take a look at the video. The Linbury Prize for Stage Design is a unique opportunity for graduating designers. It offers the chance to work with some of the UK’s leading Directors, and with an important theatre, opera or dance company. Tonight I went to see a third year production in the Studio Theatre on campus directed by Bill Hopkinson. The set and costume was design by my friend Josefine Larsen. I know how hard she has been working on them by the state the design studio has been in for the past few weeks!. The show was a storming success…but did run for three hours. Numb bottoms all round. Congratulations to everyone involved! There has been some photos taken of the dress rehearsal and i will get them up ASAP. The Postmodern. This has been the topic of Thursday morning lectures for a long while and if I’m being honest I still don’t know what it is. A new exhibition at the V and A ‘Postmodernism Style and Subversion 1970’s – 1990’s‘ brings art, design , architecture from the concept movement and explores its revolt against the modernists utopian vision. After watching this video I’m so glad they don’t know what their on about either.